If using a Spot device: Enter name the name you have assigned to your Spot. Enter an optional screen name for your account - this is what shows up on the map. There is a minimum one-month term on all SnapTrack accounts. Your SnapTrack account will thereafter auto-renew monthly until OCENS receives an email from you advising us to expire the account or move it to Standby status. NO account is expired without written confirmation. SnapTrack Standby status is billed at a monthly rate which is 30% of Active status. Your tracking history is preserved if you maintain your SnapTrack account in an Active or Standby status. All tracking history is deleted if an account is expired. This is true for promotional or rally accounts as well. Promotional or rally accounts must be moved to Active or Standby status in order to preserve the tracking history collected during the subject promotional or rally period. 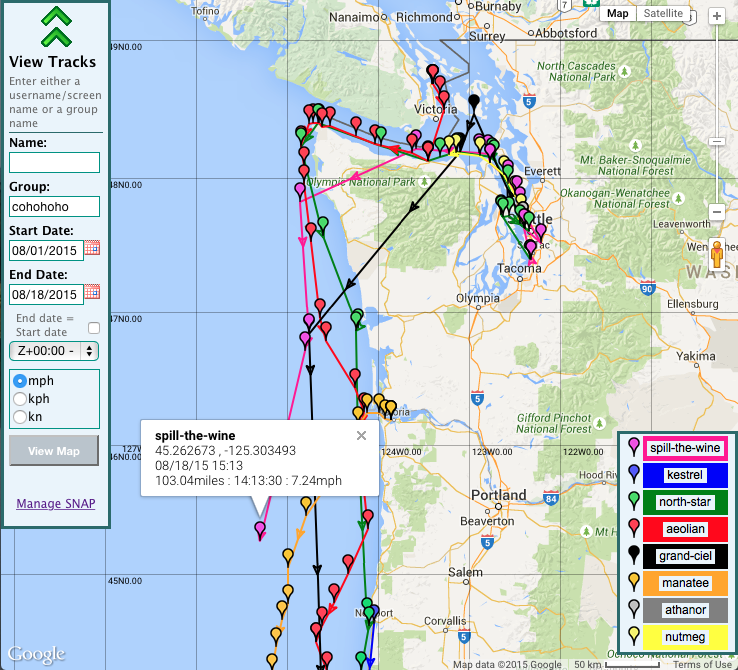 SnapTrack is tracking made easy. Log your locations so friends and family are one-click away from following you on your adventures. 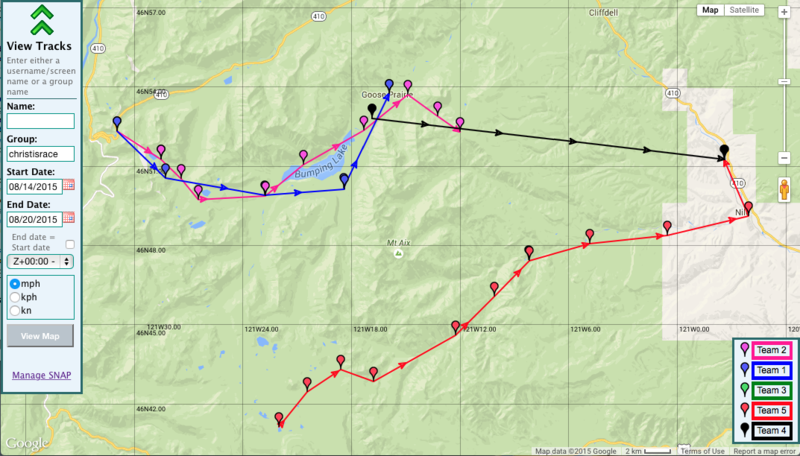 View on one screen the locations of your entire fleet of assets or all the members of your race or rally. And spend little money and less time in being able to do so. SnapTrack is OCENS response to the requests of many of our customers for a clean and simple solution to the tracking question. SnapTrack shortens the path from where you are in even the most remote of locations to a screen that captures the ‘where’ of your wanderings. SnapTrack auto renews monthly for $10. There is no limit to the number of positions you can submit to SnapTrack each month. Customer is responsible for any airtime or messaging fees that may apply. You can cancel service anytime. That’s it! Now pass the link to your SnapTrack map to friends and family so they can view your current position and the route you’ve taken to get there! SnapTrack even accepts position reports that are sent in via email! So if you have something like an older Iridium or Globalstar phone you can still use the SnapTrack service. Interested in using SnapTrack and OneMessage for your group? OCENS popular messaging service OneMessage is now another benefit of your SnapTrack tracking service. Family, friends and office can message for free by simply going to the SnapTrack page and clicking on any of your SnapTrack track points. Because outbound messages from the Snap page and inbound messages to any satellite are always free, what a great way to inexpensively and quickly communicate with offshore or remote users! No expensive international dialing or rate plans or cumbersome numbers to remember. Just click on a boat location, type and send! Multiply the savings and convenience of Snap messaging to a single boat by taking advantage of OCENS proprietary Group messaging feature. Write your message and then send it to your entire fleet with a single click. Every vessel can then message back to you individually or to the Group as a whole using the OneMessage client accompanying their OCENSMail or WeatherNet software. 6. Type your message. Any length message is allowed. 8. All outbound messages from the snap.ocens.com page are free. All inbound messages to your satellite phone are free. Where are your Messages Received? 2) Within the OneMessage client included with each OCENSMail or WeatherNet installation. The OneMessage client accompanies the install of our OCENSMail and WeatherNet packages. If using the OneMessage app, recipients will receive the messages sent to them each time they click Connect in the app. If using OCENSMail, messages are received passively with each mail check and posted to the OneMessage client running on the user’s PC or Mac. 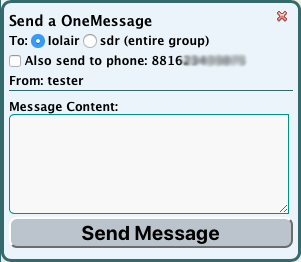 Of course, you can click Send in the OneMessage client to force it to send/receive messages outside of the passive mail checks. If using WeatherNet, messages are received passively with each pull of weather information and posted to the OneMessage client running on the user’s PC or Mac. Of course, you can click Send in that OneMessage client to force it to send/receive messages outside of the passive weather pulls. How about continuing my dialog within the Snap page at snap.ocens.com? If messaging is your first and foremost priority or if you intend to carry out longer term or multi-threaded conversations, we recommend using the free OneMessage app or client for those conversations. a. Monitor the vessel or screen name(s) being tracked in the lower right hand corner of the SnapTrack page. b. Specifically, monitor the colored dot to the left of each name. c. If a tracked vessel(s) has replied to your message, the colored dot(s) will start flashing. e. Snap messaging will reach out and pull those messages to you. f. Reply to the message and continue your conversation by clicking on any track point for that user. If a user being tracked on http://snap.ocens.com has an active OneMessage account you can send a message to their OneMessage username AND to the satellite phone they are using. Type your message. Any length message is allowed. OneMessage users who see your message on their satellite phone can reply to you and those replies will come back to you on the Snap.com page. Iridium makes it easy to send the replies from its phones. Contact OCENS if you have questions with how to do so with an Inmarsat phone. Bottomline, please remember this approach ONLY works if the SnapTrack user you are tracking and with whom you want to communicate has an active OneMessage account. So make sure to have your SnapTrack contacts sign up for a FREE OneMessage account before departing.